Once San Sebastian and Pamplona had fallen, Wellington commenced the invasion of France. In a series of opposed river crossings, the Allies forced the Bidassoa on 7th October 1813, the Nivelle on 10th November, and the Nive between the 9th and 13th of December. There were still many more rivers to cross. The 28th suffered 101 casualties in killed wounded and missing at St Pierre in another of Sir Rowland Hill’s expert little victories. At the battle of Orthez on 27th February 1814, both the 28th and 61st were present, but very lightly engaged. Wellington divided his forces again to take Bayonne and Toulouse, and on 10th April he fought his last battle of the Peninsular War outside the latter city. The war came to an end with the confirmation of the news of Napoleon’s abdication, which had taken place four days previously. Both the 2nd and 6th Divisions took part in the battle of Toulouse, but 6th Division suffered by far the greatest loss of any Allied division at this battle, which was a Pyrrhic victory for Wellington. The French army defending Toulouse were well positioned, with many earthworks having been thrown up along the hills around the perimeter of the city. The 61st (South Gloucestershire) Regiment were in Lambert’s Brigade with the 11th and the 36th. 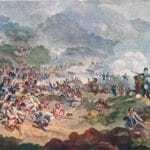 Having advanced upon and then repelled one French counter-attack from the Heights of Calvinet, and having sustained heavy casualties in so doing (including the Colonel of the 61st), Lambert’s Brigade were required to go into action again when Pack’s Highland Brigade of 6th Division suffered even heavier casualties after they and Douglas’s Portuguese Brigade had entered the fray. Charlton records the 61st as having lost a total of 19 officers, 8 sergeants and 153 rank and file killed and wounded. The battle gave rise to a macabre new nickname for the 61st, on account of so many of their dead left lying upon the Heights of Calvinet – “The Flowers of Toulouse”. Picture: Shako Plate of the 61st Regiment of Foot. In the Soldiers of Gloucestershire Museum collection.